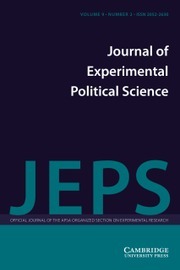 The Journal of Experimental Political Science (JEPS) features cutting-edge research that utilizes experimental methods or experimental reasoning based on naturally occurring data. We define experimental methods broadly: research featuring random (or quasi-random) assignment of subjects to different treatments in an effort to isolate causal relationships in the sphere of politics. JEPS embraces all of the different types of experiments carried out as part of political science research, including survey experiments, laboratory experiments, field experiments, lab experiments in the field, natural and neurological experiments. We invite authors to submit concise articles (around 4000 words or fewer) that immediately address the subject of the research. We do not require lengthy explanations regarding and justifications of the experimental method. Nor do we expect extensive literature reviews of pros and cons of the methodological approaches involved in the experiment unless the goal of the article is to explore these methodological issues. We expect readers to be familiar with experimental methods and therefore to not need pages of literature reviews to be convinced that experimental methods are a legitimate methodological approach. We will consider longer articles in rare, but appropriate cases, as in the following examples: when a new experimental method or approach is being introduced and discussed or when novel theoretical results are being evaluated through experimentation. Finally, we strongly encourage authors to submit manuscripts that showcase informative null findings or inconsistent results from well-designed, executed, and analyzed experiments. The journal publishes four type of articles: 1) Research Articles (4000 words) that report novel empirical findings grounded in social science theory; 2) Short Reports (1000 words) concisely summarize empirical findings that primarily inform best practices, measurement strategies, or innovations in experimental design; 3) Replications (3000 words) of previous experiments; and 4) Meta-Analyses (3000 words) of a well-defined set of experiments. Campaign Mailers and Intent to Turnout: Do Similar Field and Survey Experiments Yield the Same Conclusions?